Shares in mining firm Anglo American have fallen to a record low as the company said it would sell huge chunks of its business and shrink its workforce by nearly two-thirds. The changes will see the workforce drop by 85,000, from 135,000 to 50,000. The group has been forced to restructure after the collapse of commodity prices slashed profits. Anglo will also suspend dividend payments for a year, and consolidate from six to three businesses. All the world's big mining companies have seen profits tumble along with plunging commodity prices as demand from China has slowed. The price of oil is at seven-year lows, as is copper, and on Tuesday the price of iron ore tumbled to a 10-year low of $39.60 a tonne, after reaching a peak near $200 in 2011. As part of the restructuring, Anglo American's diamonds business will be run by its De Beers subsidiary, its platinum and base metals operations will come under Industrial Metals, and its Bulk Commodities division will concentrate on coal and iron ore.
A company spokesperson said the job cuts would be made through asset sales and internal cuts: "Bear in mind that these include assets that we will sell, so the 85,000 jobs don't [all] disappear as many will be employed by new owners of those mines that we sell." Anglo will sell its phosphates and niobium businesses during 2016 and plans $3.7bn in cost and productivity improvements by 2017. Chief executive Mark Cutifani said: "While we have continued to deliver our business restructuring and performance objectives across the board, the severity of commodity price deterioration requires bolder action." Anglo's share price has fallen by more than two-thirds over the past year. Today they fell 12.3% to 323.65 pence. In February 2011, the shares traded for more than £34 each. 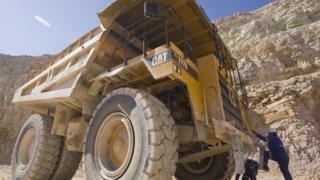 Shares in other major mining companies also saw sharp falls in trading in London on Tuesday. Glencore was down 9.3%, Rio Tinto fell 6.3% and BHP Billiton was 5.8% lower. "Anglo American, like all of its counterparties in the mining sector, has found there is no more fat to be cut and, as had been speculated for the last week, it had to face the reality that it could no longer pay out the dividend," said Alastair McCaig, market analyst at IG. "Where one goes, others will follow and the possibility that BHP Billiton or Rio Tinto might be forced into similar action now looks increasingly likely."